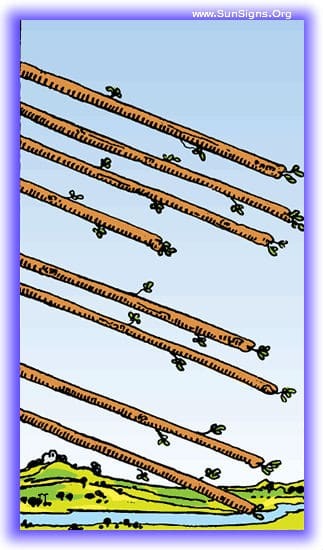 The Eight of Wands tarot card in the Minor Arcana represents having finally broken free of the struggles and hardships that have plagued your success. Speed and movement are inherent to this stage of the journey, and nothing stands in the way. Alternately, it can represent the coming of mounting frustration and hesitation. Finally, the struggles have cleared and the path forward is clear blue skies. The energy you had early on in the endeavor has returned, only now you already have the foundation built and it’s all about building and expansion. The achievement of goals will be easier than before, and rewarding busy periods are ahead. No more wasted time, no more wasted energy, it’s all progress from here on out predicts this Rider Waite card in the upright position. You’ve been experiencing a boom time in your life. Things have come fast and easy, with obstructions either being non-existent, or easily cleared away with the merest bit of effort. It’s been a relief after some of the struggles you’ve faced, to have things come smooth and easy. You’ve made a lot of progress. New projects flow across your desk and out the door like water. When something comes in, the best way to approach it and see it finished is immediately apparent and it’s a simple matter of applying tried and true methods to see it through to completion. Growth is happening every day, enjoy it while it lasts! Don’t fear the struggles you find yourself in right now, they are about to clear away and the road ahead will be opened up for rapid advancement. Soon nothing will stand in the way between you and incredible growth and success in your chosen goals. 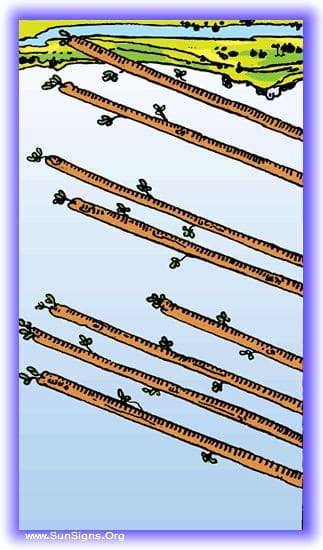 Yes is the key of this Minor Arcana tarot card , but the yes is couched in freedom and openness. All the yeses are open to you, there is not one path, but many open to you at this moment, and all of them are permitted. You’re full of enthusiasm, but life doesn’t seem as excited as you are to meet it. You make plans and they get delayed, everything seems clear, and an obstacle appears resulting in delays. This often indicates that you are planning ahead of your current capabilities and need to slow down. Pick out a couple of ideas and run with them, rather than trying to pursue all the ones your copious creative energy are throwing down. Every idea you’ve been putting forth has been met with frustration. During the past period nothing has quite seem to come to pass as you’ve hoped it would. You’ve had plans that have been barred, and none of them have quite come to fruition. Business plans are balked, and creative endeavors slowed. So many ideas, so little time. That’s the core of the problem however. With all the creative energy flowing around, all the movement, things are running into each other. It’s time to cull them out and clear the road. The obstacles you’re encountering are likely of your own creation by overextending your resources. Time to refocus and clear the road. Some plan you’re working on right now is about to run into a serious complication. The plan you’ve been working on is probably going to be immediately apparent to you as you see this tarot card come up, start making plans for it to be held off. Rather than letting yourself be disappointed, take this as an opportunity to set it up for a better time and place. A cautionary no is held for you in this Minor Arcana. No means you have not found the right path or action, and that yes is going to wait until you parse that out. Once you have cleared away the detritus the yes will become apparent.